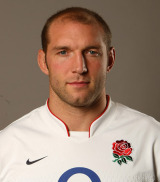 A towering second-row forward, Ben Kay won 62 caps for England between 2001 and 2009 before retiring at the end of the 2009-10 season after 11 years with Leicester Tigers. Although some will best remember Kay for spilling the ball with the try line at his mercy during the 2003 World Cup final, he was one of the most highly-rated middle line-out jumpers in world rugby. Kay was a member of Tigers' Heineken Cup winning sides in 2001 and 2002 as his international career blossomed under the guidance of team-mate and captain Martin Johnson. He made his full England début against Canada on June 2 200, displacing Danny Grewcock from the England side, and was named as the Tigers' Members' Player of the Year 2001-02. Arguably Kay 's stand-out year came in 2003 when he played every minute of every England game, except for the match against Uruguay, as England won world rugby's top prize. His line-out skills came to the fore here, particularly during games against South Africa, when Kay learned to count to ten in Afrikaans in order to crack the Springboks' line-out codes. Sir Clive Woodward selected him for the 2005 British and Irish Lions tour to New Zealand and he started the first Test of the series. He was the only player to play every minute of England's 2007 Rugby World Cup campaign, culminating in their narrow loss in the final. In doing so, he became one of only four players to have started both the 2003 and 2007 Rugby World Cup Finals, the other three being Jonny Wilkinson, Jason Robinson and Phil Vickery. In his penultimate season, Kay started both the 2008-09 Heineken Cup final and the Guinness Premiership win the same season. And in his final year, Kay was an instrumental figure in helping the Tigers win the 2009-10 Guinness Premiership. Kay will serve as a commentator for ESPN's Aviva Premiership coverage in the 2010-11 season.